Tidal tails have originally been discovered on deep photographic plates (see Section 2.1) revealing the optical light emitted by stars. This monochromatic, black and white, view hides the variety of components and physical processes hosted by collisional debris. Their multi-wavelength observation and analysis were boosted in the 90s (Schombert et al. 1990). We present here-below an overview of the recent colorful view of tidal tails. The average optical color of tidal tails is consistent with the bulk of their stellar population being older than the interaction, and originally born in the disk of the parent galaxies. Tidal tails however host bluer regions, whose light is dominated by OB-type stars. Given the life time of OB stars (less than 10 Myr) and the typical dynamical age of tidal tails (100 Myr), the young stellar component has been formed in-situ. These giant star-forming complexes are usually compact and appear detached from the rest of the tails, explaining why they were once believed to be ejected galaxies (see Section 2.2). Knots of star-formation are responsible for the bulk of the ultraviolet emission also emitted by tidal tails. Star formation is partially hidden by dust cocoons. Heated dust causes the infrared emission of tidal tails. The formation of stars requires the presence of gas. The main reservoir is atomic hydrogen, detected through the emission of the radio 21cm hyperfine line; it hosts pockets of molecular gas in which stars are born and that are detectable in the millimetric domain, using emission lines of molecules such as carbon monoxide. This section emphasizes the importance of multi-wavelength observations for studies of the physical properties of tidal tails, especially those formed during major mergers. One of the first galaxies to have been fully mapped at 21 cm is the Antennae galaxies (van der Hulst 1979, see also our Figure 7, panel 6). These early observations obtained with the Westerbork Synthesis Radio Telescope (WSRT) revealed that about 70% of the total amount of hydrogen in the galaxy pair is distributed along the optical tidal tails. For comparison, tidal tails account for only a few percent of the stellar component of colliding galaxies. The HI gas appears as the principle, most massive, ingredient of tidal tails and is thus one of its best tracer. Figure 7. A sample of interacting systems covering the various stages of major mergers, from the initial phases of the encounter (top left), to the last ones and formation of a relaxed object (bottom right). 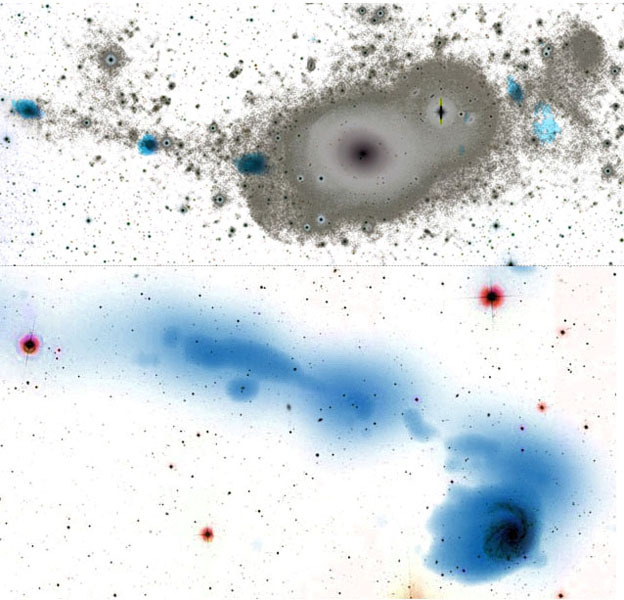 The gaseous component (atomic hydrogen) is superimposed on true color optical images of the galaxies, showing the distribution of the young and old stars. See Table 1 for details on the data. Furthermore, since the HI component is almost always more elongated than the stellar disk (by a factor 2-5, depending on the morphological type of the parent galaxy), it is less gravitationally bound than the stellar disk. As a consequence, gaseous tails are more easily produced than stellar ones. Hibbard (1995) used the Very Large Array (VLA) to carry out one of the first systematic study of HI in pairs of galaxies. Observing systems of the so-called Toomre sequence (see Figure 3), he was able to reconstruct the evolution of the gaseous component during a merger. Together with numerical simulations, these data show how part of the gas is stripped along the tails, while a fraction of it sinks into the central regions, sometimes via a bar and fuels there a nuclear starburst or an active galactic nucleus. Finally, observations of the 21 cm HI line have the additional advantage of providing the radial velocity over large scales. As emphasized in Sect. 3.5, a large variety of orbital parameters and corresponding models should be explored to reproduce the morphology of interacting systems. Having the complete radial velocity field restricts the parameter space. Tidal tails are too diffuse to allow spectroscopic measurements in the optical regime except in compact HII regions. Emission line regions are however not numerous enough in tidal tails to allow a correct sampling of the velocity field, contrary to the HI probe. Since the pioneer HI observations mentioned above, numerous colliding systems have been mapped with the WSRT, the VLA, the Australia Telescope Compact Array (ATCA) or the Giant Metrewave Radio telescope (GMRT). In a vast majority of cases, there is a very good match between the HI and the stellar components. The old stellar components and gas perfectly overlap, whereas young stars are formed at the HI peaks. In a few rare cases, an offset is observed between the gas and the stars (see e.g. System 8 on Figure 7). The origin of the star/gas offset is debated: it may be due to different initial distributions of both components (e.g. Hibbard & Yun 1999) or additional processes that act on one component and not the other. For instance, ram pressure due to the interaction with the intergalactic medium might strip the HI gas further away (Mihos 2001). Meanwhile, blind HI surveys have disclosed the presence of numerous intergalactic, filamentary, HI structures apparently devoid of stars (see the review by Briggs 2004 and references therein). Some may be of tidal origin. Spectacular examples are visible in the M81 group of galaxies (see System 1 in Figure 7). Looking at the optical image of the M81 field, it might be difficult to infer that the three visible main galaxies are involved in a tidal interaction. The HI map of the same region provides a different picture and reveals a complex network of tails and bridges connecting the three galaxies. The HI Rogues gallery compiled by J. Hibbard 4 exhibits similar cases, emphasizing the role of HI as the most sensitive tracer of on-going tidal interactions. As a matter of fact, this may be a too simple picture. Recently the optical regime had its revenge: with the availability of sensitive, large field of view CCD cameras, the surface brightness limit reached in the optical has gained several magnitudes. Diffuse light up to 29 mag.arcsec-2 can be probed (Mihos et al. 2005, Ferrarese et al. 2011). In the nearest systems for which individual stellar counts are possible (with current technologies, in the Local Group), limits of 32 mag.arcsec-2 are reachable (McConnachie et al. 2009). At these limits, the most massive HI tails do exhibit a stellar counterpart. This is likely the case for the M81 group (Mouhcine & Ibata 2009), and many other interacting galaxies with available ultra-deep optical images (Duc et al. 2011). An example of a newly discovered optical tidal tail, discovered as part of the Atlas3D survey (Cappellari et al. 2011) is shown on Figure 8 (top pannel). Figure 8. 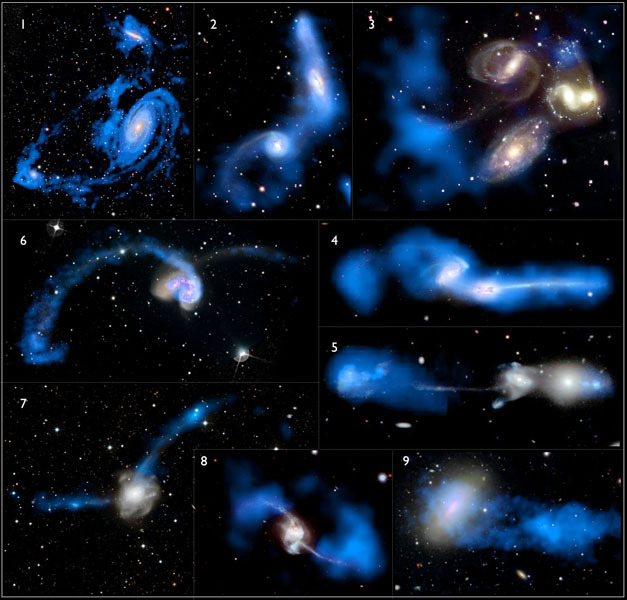 Examples of a gas-poor and gas-rich tidal tails: NGC 5557 (top, Duc et al. 2011) and NGC 4254 (bottom, Duc & Bournaud 2008), The HI component is superimposed in blue on optical images. For both systems, the tails result from an encounter with a massive galaxy, which has merged in the case of NGC 5557 or just flied by for NGC 4254. The tidal tails of NGC 5557 are best visible in the optical as extremely low surface brightness structures, whereas the HI emission is patchy and concentrated towards a few optical condensations. The tail of NGC 4254 has no optical counterpart and was once believed to be part of a dark galaxy, known as VirgoHI21. Figure 9. 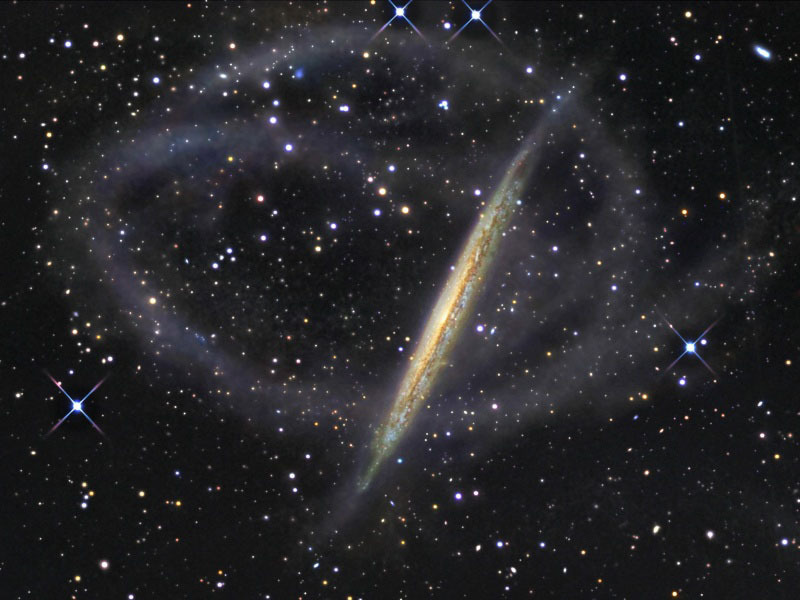 Faint stellar streams wrapping around the spiral galaxy NGC 5907, seen edge-on. They are most probably due to a disrupted small dwarf spheroidal satellite. Such minor collisions are quite common around galaxies, including around our own Milky Way. Courtesy of R. J. Gabany in collaboration with Martínez-Delgado et al. (2010). HI intergalactic structures without any stars are thus much less frequent than once believed. A few of them however have escaped an optical detection. The Magellanic Stream in the local group is the most famous of them. This HI structure is the largest tidal tail detected in the Local Group (Nidever et al. 2010). It has for long been attributed to a tidal interaction between the Magellanic Clouds and possibly our Milky Way (e.g. Connors et al. 2006). However the absence of stars along the stream 5 was used to claim that this structure might in fact result from ram-pressure (Moore & Davis 1994). Indeed, ram-pressure only acts on the gas. The HI is stripped along filaments that may be mistaken with tidal tails. Instances of long HI tails, likely of ram pressure origin, may be found in the Virgo cluster (Chung et al. 2007). However, flybys, i.e. collisions at high velocity which do not result in a merger, might as well produce tails without any stars, provided that the companion is massive enough to grasp gas from the target galaxy but resulting gravitational forces too weak to drag the stars (Duc & Bournaud 2008). Such tails are of tidal origin but could themselves be mistaken with filaments created by ram-pressure. According to a more exotic scenario, star-less intergalactic HI clouds might reveal the presence of so-called "dark galaxies", i.e. galaxies embedded in a massive dark matter halo that would contain very few baryons, only in the form of gas (see the proceedings of IAU symposium 244 dedicated to dark galaxies and Minchin et al. 2007). An example of such objects is VirgoHI21, near the spiral NGC 4254 shown on Figure 8 (bottom panel). The elongated cloud exhibits a strong velocity gradient, as if it was rotated and moved by an unseen dark component. But here again, such a velocity field might be explained by streaming motions generated by a tidal collision (Bekki et al. 2005, Duc & Bournaud 2008). It is not unlikely that the isolated HI clouds found in deep surveys such as the Arecibo Legacy Fast ALFA Survey (ALFALFA, Kent et al. 2007) are simply collisional debris. Finally, another interpretation has recently gained popularity: the clouds and filaments around galaxies might divulge accretion of gas from so-called cold filaments. Simulations and some theoretical models emphasize the key role of external accretion of gas in the evolution of distant galaxies (Dekel et al. 2009). Primordial accreted clouds should be devoid of stars and have a low metallicity, whereas the metallicity of tidal debris should be high. This characteristics provides a method to disentangle tidal and cosmological origins for starless gas clouds. In practice the measure of element abundances is extremely difficult for objects with no optical counterpart. Stellar tails without any gas are rather common around massive galaxies. Usually such streams are rather narrow and associated with tidally disrupted satellites. The gas of the progenitors might have been stripped, evaporated or consumed well before the satellites were destroyed by their giant hosts. Stellar streams are regularly discovered in our own Milky Way: the Sagittarius and Monoceros streams are among the most famous ones (Ibata et al. 2001, Yanny et al. 2003, Belokurov et al. 2006). Numerical simulations show how a satellite might be stripped of its stars, wrap around the main host galaxy before eventually falling in (e.g. Mayer et al. 2001). A spectacular example of a disrupted dwarf in the halo of a spiral galaxy is shown on Figure 9. If old stars and HI are the principle contributors to the mass of tidal tails, they are accompanied by many other additional components. In fact collisional debris contain all the usual constituents of the interstellar medium of galaxies. A key ingredient is obviously the molecular gas in which stars are formed. Braine et al. (2000) reported the first detection of carbon monoxyde at the tip of two tidal tails. Surveys of colliding galaxies with HI-rich tidal tails lead to several other detections (Smith & Struck 2001, Braine et al. 2001, Lisenfeld et al. 2002). Follow-up CO(1-0) mapping with interferometers has been achieved in a few systems (Lisenfeld et al. 2004, Walter et al. 2006). CO clouds were detected towards local HI peaks (and HII regions), with observed H2/HI mass ratio ranging from 0.02 to 0.5. This supports the hypothesis that the molecular gas has been formed locally out of collapsing HI clouds (Braine et al. 2000). However the later-on CO mapping of entire tidal tails revealed the presence of molecular clouds outside the HI peaks, leaving open the possibility that the molecular component (or part of it) might have been directly stripped form the colliding galaxies at the same time as the HI and stellar components (Lisenfeld et al. 2008, Duc et al. 2007). The detection of CO at the tip of tidal tails indirectly reveals that heavy elements are present in that environment. The oxygen abundance could be determined in HII regions located along the tails (e.g. Weilbacher et al. 2003). Typical values are between one third and half solar, even at distances of 100 kpc from the parent galaxies. For comparison, abundances in the very outskirts of isolated spiral galaxies range between one tenth to one third solar (Ferguson et al. 1998, Bresolin et al. 2009). The disk of spiral galaxies usually exhibit a strong metallicity gradient, with a possible flattening in the outmost regions (Bresolin et al. 2009); no such gradient has yet been measured in tidal tails (Kewley et al. 2010). The presence of cold dust in tidal tails has been first disclosed on far-IR images obtained with the ISO satellite (Xu et al. 2003). Dust continuum emission in collisional debris has later-on been mapped by Spitzer (Smith et al. 2007, Boquien et al. 2009) and more recently by Herschel. Furthermore the star-forming regions along tidal tails also exhibit mid-infrared emission features associated to polycyclic aromatic hydrocarbon (PAH) grains (Higdon et al. 2006, Boquien et al. 2009). How did tidal tails acquire their metal-enriched components? Local stellar feedback during in-situ star formation episodes contribute to the metal production. However the onset of star-formation in collisional debris is likely too recent and the star-formation rates too small (see below) to explain the measured abundances in heavy elements. Another hypothesis is a global enrichment of the interstellar/intergalactic medium by stellar superwinds or enhanced AGN activity in the core of the merging galaxies. Nuclear outflows might eject metal-enriched matter (in particular dust) up to large distances, as observed for instance in M82 (System 1 on Figure 7 and 10). Alternatively, radial gas mixing during galactic collisions might account for the lack of metallicity gradients in tidal tails and the presence of dust at large galactocentric distances, as recently shown by numerical simulations of mergers (Rupke et al. 2010). 5 Though, a stellar component has been found associated to the Magellanic Bridge. Back.